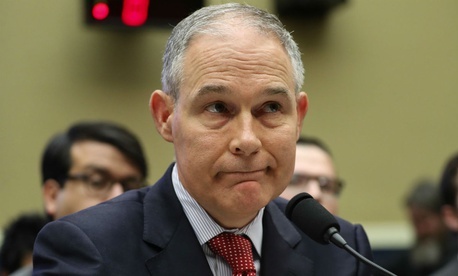 Environmental Protection Agency Administrator Scott Pruitt testified to Congress last month that his heightened security detail was prompted by threats “unprecedented in terms of quantity and type,” as confirmed in an inspector general report. But he was contradicted on Monday by the EPA’s watchdog. The IG had also reported that the special agent in charge for Pruitt’s security—Pasqual “Nino” Perrotta—made the request, not the IG or the EPA Office of Homeland Security. Pruitt, the subject of multiple investigations for spending on first-class travel, a sound-proof booth in his office and a 24/7 protective service unusually expensive for the head of EPA, told House members on two committees last month that he has been subjected to verbal threats from strangers at airports since he was confirmed on Feb. 17, 2017. The senators asked an array of questions on whether the IG’s office performs threat assessments, how threats to Pruitt compared with those to previous administrators, and how the IG determines what to audit or investigate. The inspector general explained that the August document was not a threat assessment, and that his office does perform more generic “threat investigations.” But that “does not necessarily mean that every case opened [by the inspector general] as a ‘threat investigation’ reveals evidence of an actual threat,” the IG’s letter said. The IG also explained to the senators that there is no “statutory or regulatory requirement for producing” a report such as the August 2017 memo. In response to other questions, the IG said no one from Pruitt’s staff had asked the IG for help in deciding what became controversial raises for Pruitt’s team, or help in preparing talking points for congressional hearings. Because assistant IG Sullivan is a professional friend and colleague of Perrotta’s, the IG noted, he will recuse himself from future related probes as a precaution.